Digital printing has increased customer expectations for flexibility and customization, as well as quicker turnarounds and lower prices. 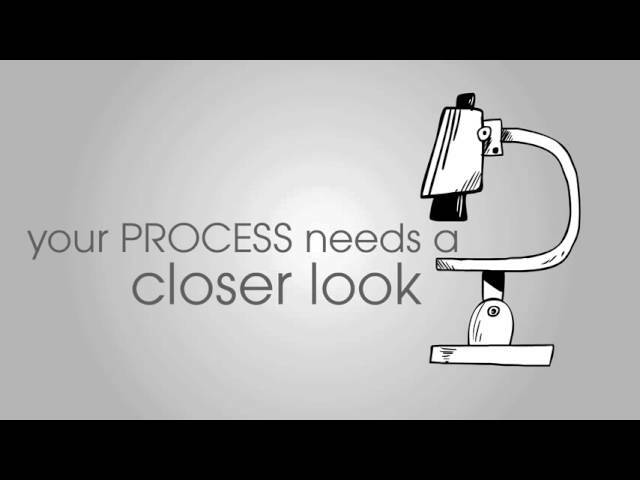 See how tFLOW helps service providers keep up with the pace by providing online preflighting and collaboration, automatic proof creation, project management, and automated prepress. 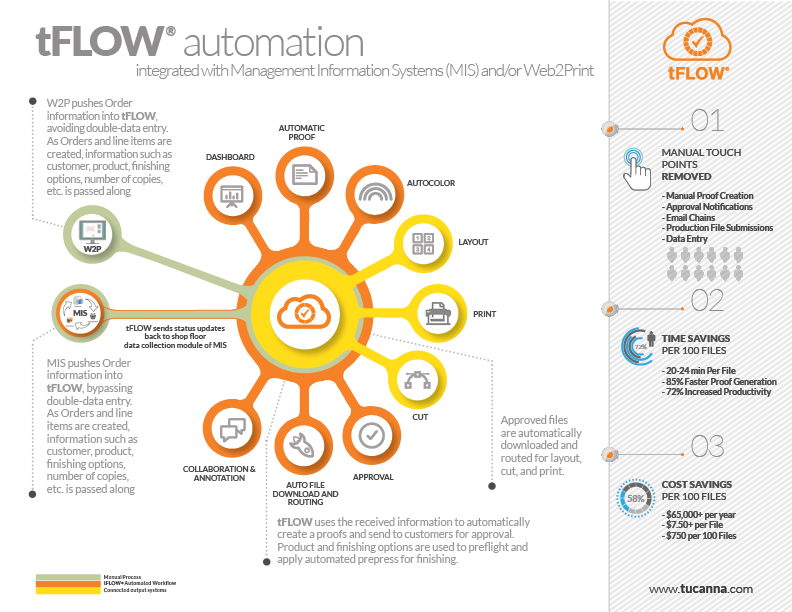 Time-saving tFLOW Automation empowers bluemedia to meet intensifying demand with ease. 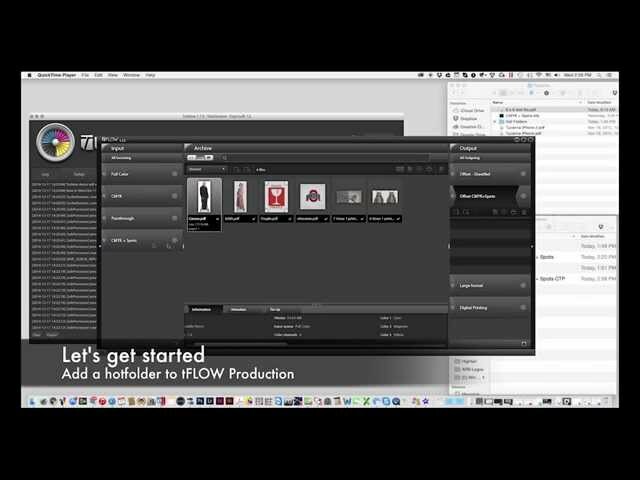 tFLOW is a powerful digital and large format automation workflow that simplifies difficult file management tasks and processes to optimize efficiency and production throughput. Low cost of ownership access the latest technology on the market today. tFLOWs modern and open architecture easily integrates with any MIS, Web2Print, ERP and Output Systems. tFLOW eliminates redundant manual touch points and provides team communication tools for the 21st century. Customers, sales representatives, prepress operators and production teams collaborate in real-time 24/7 with total visibility, eliminating email chains, text messages and calls that cause missed deadlines, delays and costly mistakes. 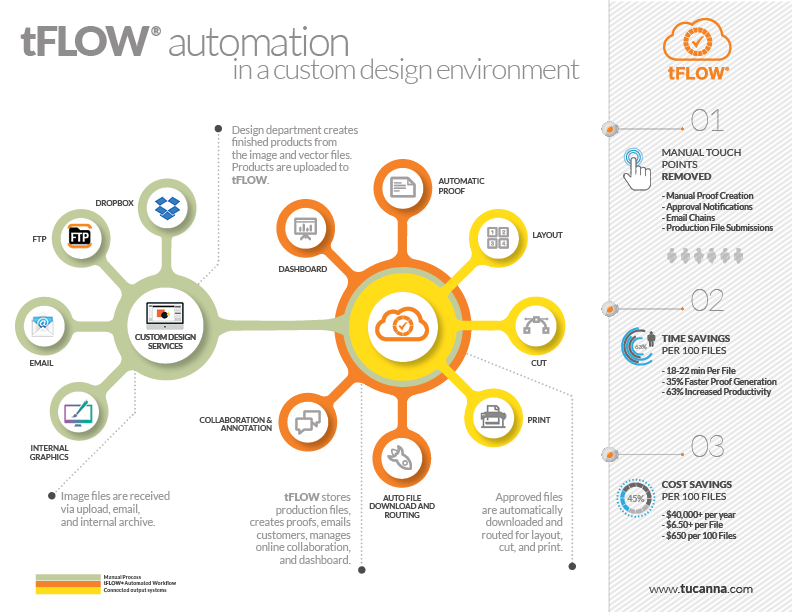 tFLOW proof is simplified and tailored for designers or teams to automate proofing and client approvals. Lowest Entry Price! tFLOW preflight includes the same features as the Proof package, with added space and automated preflighting on incoming files - in minutes! tFLOW professional is tailored to small and mid size companies that process 20 to 40 files per day, with added space and custom proof templates. 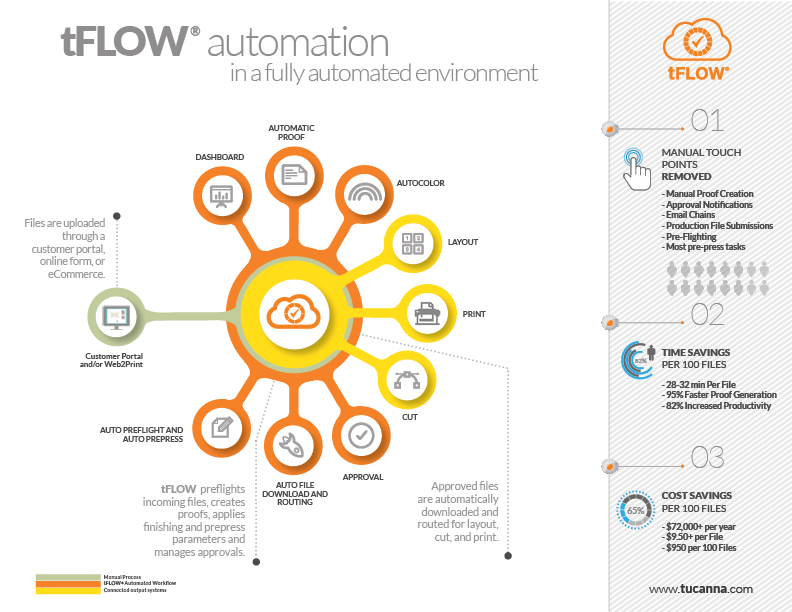 tFLOW enterprise: our state-of-the-art, flagship package. Most popular with mid to large sized companies. If you are interested in tFLOW, let us know and we'll make you a quote. tFLOW automatically creates proofs based on your templates. Create your own layout with the information you would like to appear on the proof, and tFLOW will autofill the fields as well as automatically place artwork on landscape and portrait layouts. You can also add elements such as marks, trim, live area indicators, and finishing parameters. Proofs are automatically sent out for approval, and can also be downloaded as PDF’s. Stop the email madness! Tired of receiving emails, and being CC’d on countless others? tFLOW allows you to collaborate realtime, making comments and annotations on the proof quick and simple. Now you can go to lunch with a clear conscience. Everything about the job is visible to everyone on the team – not lost somewhere in your inbox. Realtime information and updates. Stop running around and bombarding everyone with emails. 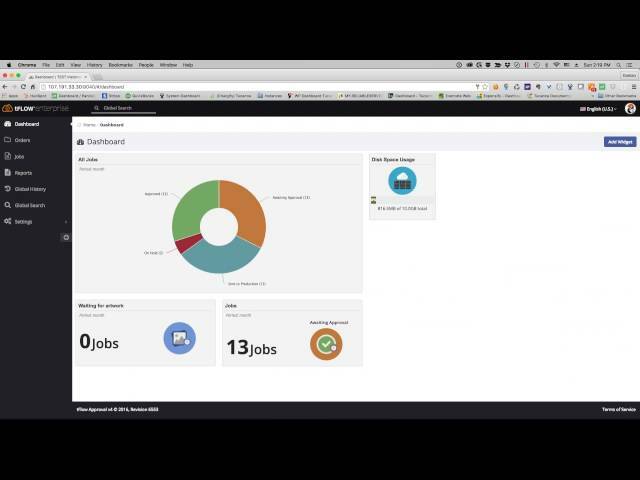 tFLOW® will give you status updates on all of your jobs every 15 seconds. Keep track of jobs which are still waiting for approvals, missing artwork, on hold due to preflight errors, and ready to be sent to production. All without a single phone call or email. Ready to stop the chit chat and get some real work done? Automate repetitive Prepress tasks Let designers be designers – spend time on custom projects by automating the boring stuff. Life’s too short to spend the day adding grommet marks, cut paths, bleeds, fold lines ... tFLOW doesn’t mind, and is way faster than anyone we have ever met! As Aleyant has been focusing their latest releases on providing the best possible user experience, you may have noticed some important changes in tFLOW over the last couple of months. While you can visit the tFLOW History page for a full list, below is a short summary of the most recent highlights from version 10. Email Replies and Approval - tFLOW’s new “Reply” capability allows users to reply to messages as well as Approve and Reject jobs directly from their email applications. Replies: At the top of status and messaging alerts, there is a small text that says ===WRITE YOUR REPLY ABOVE THIS LINE===. Any text written above this line and sent will be added to the message window as an individual comment or part of the ongoing conversation, while tFLOW will also attempt to eliminate additional information such as disclaimers. Floating Messaging Window - The next releases will see several enhancements to tFLOW’s communication capabilities, the first of which is included in this release. The messaging window is now free floating, and can be accessed, moved, and resized at will. Improved Inventory Sheet - Users can now configure the number of jobs per page when generating Order inventory sheets. System settings can be configured to default to a specific value, or to automatically determine the number to fit as many jobs as possible (up to 9). New Documentation - tFLOW documentation has been updated and structured in a way that allows new users to follow along in the same way they work in the application, as well as for seasoned users to quickly find and brush up on specific areas. In addition to availability on the Aleyant support site, access to the documentation is also available from within tFLOW itself using the “Documentation “ button. 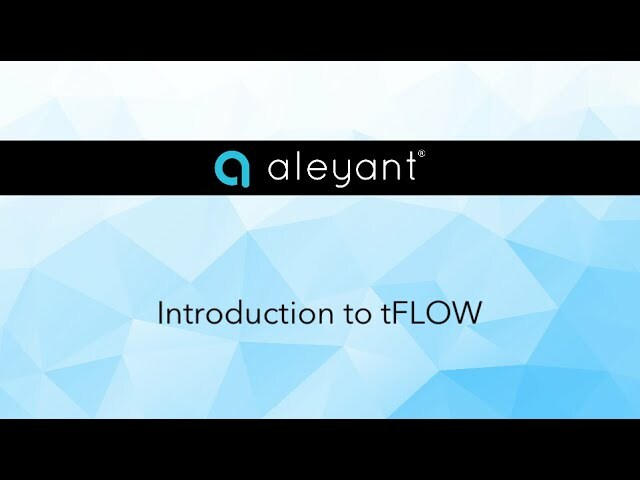 As Aleyant have been focusing their latest releases on providing the best possible user experience, you may have noticed some important changes in tFLOW over the last couple of months. While you can visit the tFLOW History page for a full list, below is a short summary of the most recent highlights. In addition, view this video to see these updates in action. The default tFLOW proof layouts have been combined into one unified proof which is optimized for large and small screens as well as mobile devices. Users can easily scroll through the proof information fields on any device as well as view the entire proof layout on virtually any window size. You may still define your own proof layouts, but the new Aleyant unified proof is a great place to start. Main job options have now been reduced to just two – Approve or Reject. Users with permissions will have the ability to Reject and upload new artwork, while user without will be able to Reject only, and be presented with a much clearer screen informing them that a new proof will be available shortly, removing the previous uncertainty on what to do after rejecting a proof. We’ve added two more ERP systems to our ever-expanding list of integrated solutions: SAP One, and EFI PrintSmith. tFLOW version 9 is packed with some great new features that will supercharge your print shop's efficiency, helping you get jobs completed and out the door quicker. See below for more details regarding these new features. 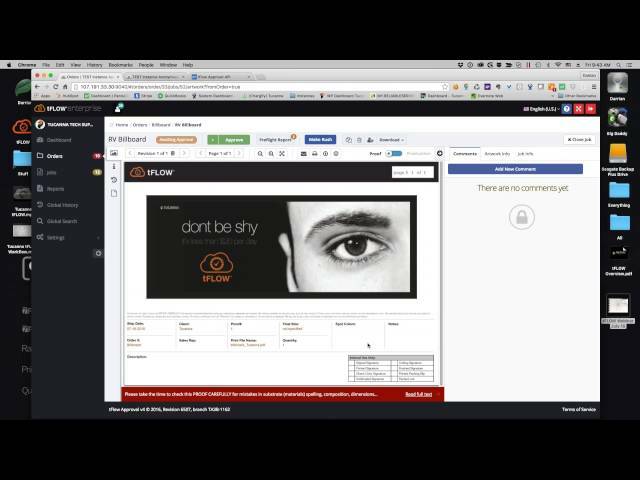 Watch this video to see tFLOW's latest updates! New UI - Our redesigned page headers make tFLOW easier to use. In addition, the new job and proof views enable users to easily and quickly change job status, move jobs to production, move between proof and production files, view various versions and more! Welcome eMail - We've added the capability to send customizable welcome emails for new user creation to enable users to easily view and approve jobs within tFLOW. Tab-Managed Links - tFLOW now enables users to have smarter access with public (no log in required) and private login links. tFLOW can automatically recognize which users have private and public access and allow them to use the tFLOW accordingly. Approval Reminders - You asked and we delivered. tFLOW now has a “Send Reminder” option for users on the job screen, which allows users to follow up easily on needed job tasks. More Flexible API - tFLOW's user-defined SmartPrep variables can be sent directly through API with no development needed. tFLOW already has a comprehensive list of readily available variables for you to use, but the good news is that if there is something you need but can’t find, you can create your own! Coming Soon! Order-level email notifications will be available soon, which will greatly reduce back and forth emails with customers. tFLOW version 8.5 is packed with some great new features that will supercharge your print shop's efficiency, helping you get jobs completed and out the door quicker. See below for more details and an overview video on these new features. Be sure to update tBOT to the latest version, so that it integrates seamlessly with this updated version of tFLOW. You can do this by clicking on the 'Update' button in the upper right corner of the tBOT window. View the tFLOW 8.5 overview video! Automation Asset Manager - Now you can manage your own cut paths, overlays, profiles, fold lines, automation scripts and more. Easily drop and drag assets as well as organize, import and export files within tFLOW. Order Status Report - New and comprehensive email report that keeps you up-to-date on the entire order with just one email. Now you can quickly and easily view a job's order summary, order activity and job activity and status all in one place. Best of all, you can now schedule to have this report sent to other team members and customers. eMail Alert - New mobile-friendly layout for status reports and email alerts. These alerts now have a configurable job summary area and list preflight errors (if present). 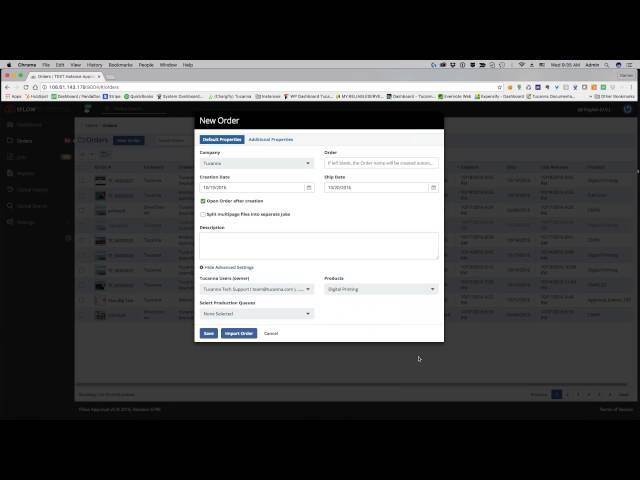 Pressero Integration Enhancement - tFLOW now pulls data from Pressero pricing engines to allow you to configure your tFLOW automation. So for example, if a customer chooses a certain size, or needs white, or a cut path, or to add certain finishing like hem or grommets, etc., all of those choices can be passed from Pressero and configured automatically within tFLOW to auto process the files according to those choices. New UI - Updated Order and Jobs screens with common modern interface and option menus. Contextual Sidebar - Quick and easy access to all main functions and information via readily accessible panel. Improved Messaging - Combined messaging brings all Order and Job comments to the same window. Configurable Email Body - Content of email can be adjusted to display/hide information. 3rd Party Plugin Improvements - Updates to MIS and W2P integrations allow for more flexibility and functionality. Changed support link in tFlow. 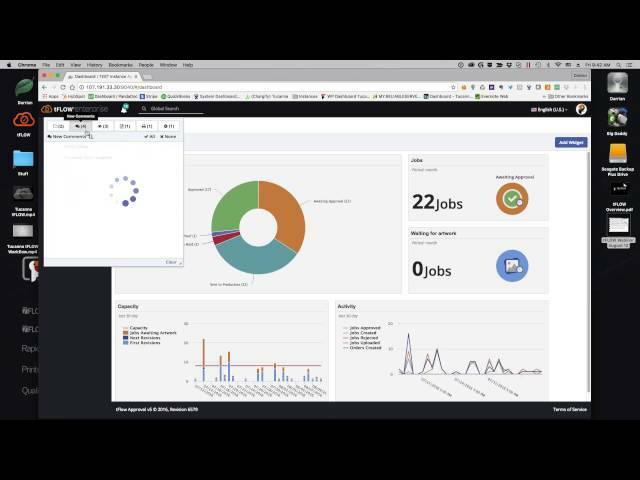 Netsuite connector: allows to turn off and on replicating order state from tFLOW. Disabled commands for archived job. Fixed bug with proof window not updated after editing the job. Fixed email notification encoding issues. Fixed a bug with empty order page. Fixed a bug preview window not full size. Fixed an error with job info area cut off. Wrong links to “jobs” widget in mobile version. Fixed and error with Server Side Events and Microsoft Edge browser. Fixed and error with Approve button not updated. Fixed missing approve button in the invitation page. 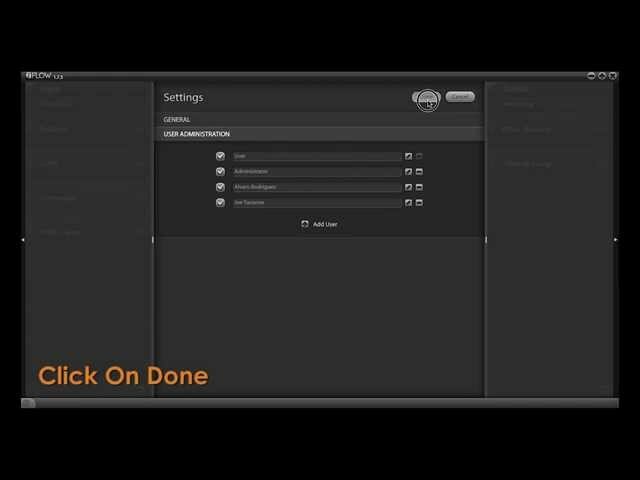 Add disclaimer message and link to tFLOW login screen. Implement parallel processing to improve performances. Implemented Server Sent Events technology. Default of Autoassign user to new orders. Add input sanitization for all relevant request handlers. Implement an order-level status report email. 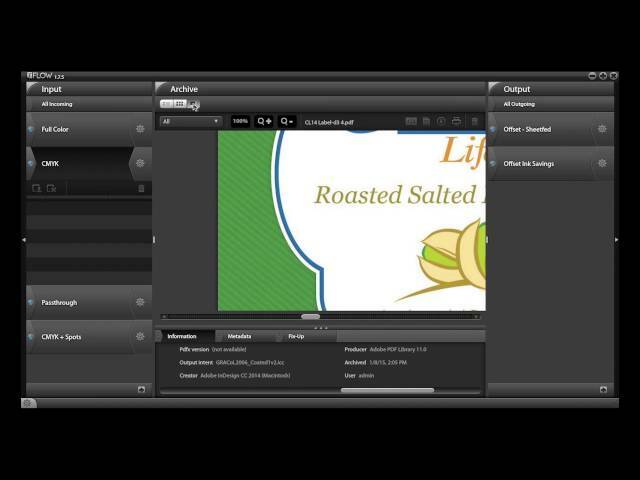 Add ImageMagik file types conversion customizable. Change in PDF file dimension (XML report). Improved API and API documentation. Improved jpg Preview with large dimension. Missing notification settings to Turn All Off and Turn All On. Missing “Make Default” in the products window. Validation for deletion Automation Scripts and Products. Double quotes symbol is not escaped correctly when generating proofs. Allow to download report.xml via API. Add logging for successful processing of XML files. Import XML, wrongly encoded char is locking the queue. Missing vars for pages in dynamic rsp. Disable “Create” buttons while processing. “Create New Product” modal, dropdown “Limit Product only to” should be “empty/unselected” by default. Better message for not being able to delete a profile needed. Assign to new companies should not be visible for non-instance users. When creating users from within the Companies window, the Client should be limited. Change to “Success!” and “Your artwork has been submitted successfully”. Missing a dropdown with a default set of alerts for Customers, Sales Representatives, Designers, etc. The same list as in workgroups. tFLOW generated extra large file size proof. tFLOW not displaying bleed properly. There is no status window during upload for revisions – in this window, I dropped a file here, and nothing is showing. Comments emailed to all on the job regardless of checked/unchecked recipients. Error 500 creating an order. Import & New Company Not Working. Production Queue in order level. Attach proof PDF to email alerts. “Auto assign this user to new Orders” doesn’t work. Kanban view date not displaying properly. User role unclear. One role is partly hidden, and it is also unclear how more than one role can be selected. Approval down and files failing in Production. Need to improve XML error message. Old tBOT queues not flushing from tFLOW list. Date not showing correctly in Kanban view. “waiting for artwork” message says “Waiting for artwork waiting for”. tFLOW Support – Error when importing additional parts of an order. Extra data fields in one product. Existing Job wont import additional pieces. The type in the description field does not wrap. Should be able to write paragraphs. SMTP fields are blank but still working. 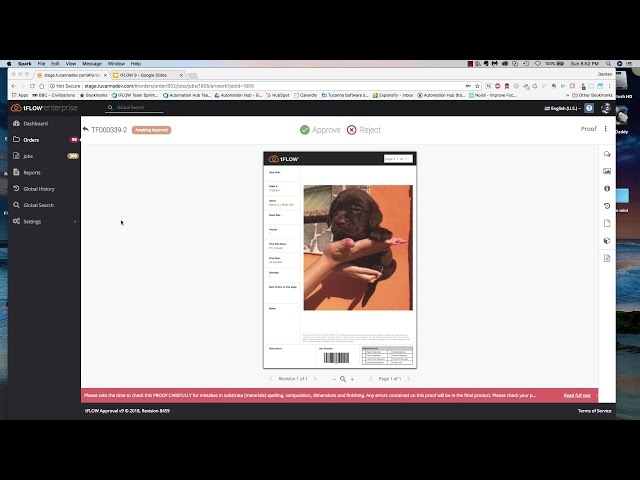 Pulling low-res image using API. Missing low res in download area in version 5.
tBOT hanging when typing in destination directory. tBOT io error when sending to networked drives – v .41. Content Approval Proof Fields in tFlow. Adding company user to job removes proof. After editing the job info for creation and ship – it will always set the day one day behind specified date. No longer shows how many total jobs/orders. History search field is out of screen. Typo in “Edit Variables” dialog box. The typo: Sign not Sing. Editing and propagating order props is clearing some job props. The “Import Order” modal, clicking on global check box is not selecting all. Typo in text of the default disclaimer. Anonymous upload: phone number not transmitted to user data. Anonymous Upload, Validation Error: “name contains characters not allowed for names”. Orders\Jobs tables looks wrong (uninitialized) if user have only “basic” permissions. “Create/Edit user” modal, checkbox “Auto assign to new companies” should be hidden for users of customer companies. Finishing applied multiple times if unapproved. Add spinning wheel after Approve (during the Finishing run). History filtering not working properly. These product do not delete, and there is no reason given why. Simply nothing happens. Page size always of the first page. Looping error when Order or Job is deleted for an email link you click on. Tucanna designed tFLOW to streamline the way files get from customer to print. Jonathan Jackson, the soft signage & digital grand format Print Producer from Xarisma, says tFLOW does a great job with everything from preflighting to separating files, maintaining color consistency and eliminating redundant work. S2K Graphics is an established firm with more than 25 years specializing in POP graphics, digital large-format printing, and screen printing. Based in Tennessee and California, S2K Graphics is part of the Franke Group and has a nationwide sales network. Frustrated that their ERP workflow system required too much paperwork to manage digital files, VP and General Manager Phil Garcia sought a new solution. When he heard about Tucanna tFLOW from Mike Ruff in November of 2012, he immediately recognized the potential of tFLOW automation. Tucanna conducted an in-depth analysis of S2K Graphics’ needs, and then developed a custom workflow solution. The tool allowed S2K to manage all of their workflow online and greatly reduced the amount of time needed to get approval. Says Mr. Garcia, “tFlow Approval was customized to our needs, which is the main reason we chose it. We upload 200 files per day. With no email chains from Graphics to CS, the client, Sales, and the Art Department, tFlow Approval cuts through layers of complexity and dramatically improves throughput and accuracy.” The software also lets S2K provide better service to their remote sales people, which in turn benefits their bottom line. bluemedia, a supplier to MLB and NFL franchises for vehicle and large format environmental graphics company, produces high-profile graphics for exterior defense mesh, field walls, and building wraps. With steady growth and demand for their products and services, the company found themselves needing to handle 100 new files per day but orders and files were being bogged down unnecessarily in preflight. As a result, they decided to pursue a workflow automation solution. The tFLOW platform provides an affordable, customizable solution so powerful it can transform businesses by automating the majority of repetitive prepress tasks — all from one simple dashboard. tFLOW also acts as a seamless collaboration platform. Clients can receive proofs without even needing to download the software. Those with more technical expertise can follow a more streamlined approval profile, while those needing more oversight can follow another. “One of the things we liked best about tFLOW is that it can be as light or intensive as you need it to be,” explains Mr. Wijdenes. tFLOW 9 is packed with some great new features that will supercharge your print shop's efficiency, helping you get jobs completed and out the door quicker. What's new? Is it the first time you login for tFLOW? Create your account with the help of this webinar. 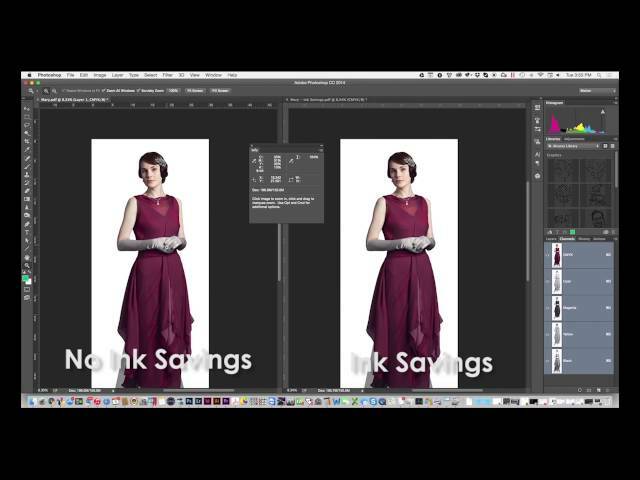 See how to use tFLOW Production for automated preflighting and prepress tasks. Process files for ink savings in order to decrease production costs. 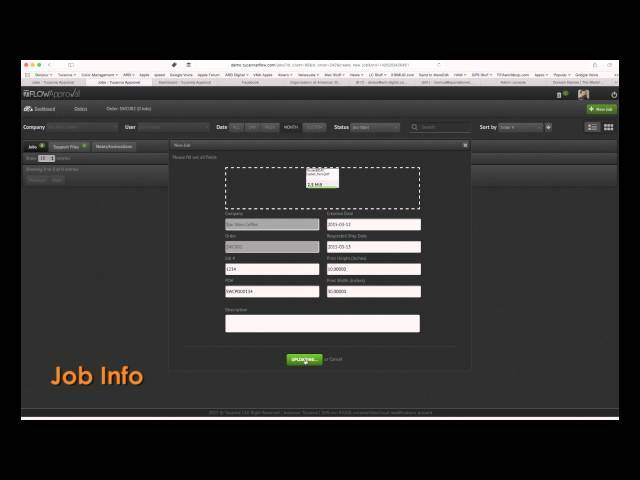 Learn how to set up and configure users in the tFLOW Production environment. 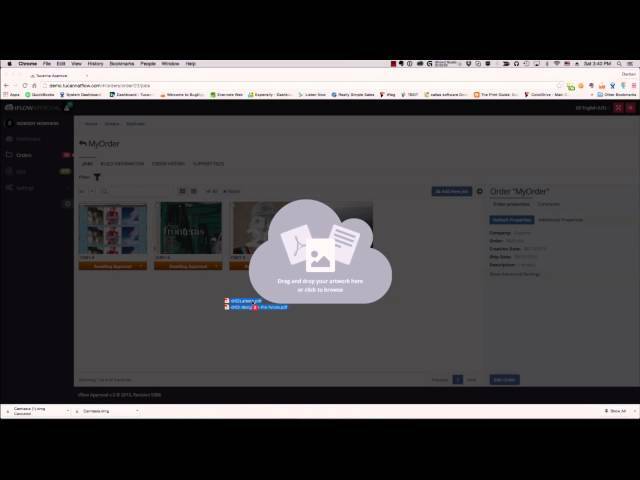 Automating wide format and digital print using hotfolders. David van Driessche, CTO at Four Pees gives an introduction video on tFLOW Production turbine and client. David van Driessche, CTO at Four Pees gives an introduction video on tFLOW Production and the turbine. In this tutorial, I preflight a magazine advertisement. I use a callas pdfToolbox Profile. The preflight profile has several checks and fixes to optimise the PDF file for magazine printing according to the GWG 2015 specifications. Drag and drop the pdfToolbox preflight Profile "Magazine ads (CMYK) (GWG 2015).kfpx". The automation script "Magazine Ads (CMYK) (GWG 2015)" is added in the Automation Scripts list. Enter the product name "Convert to Magazine Ads (CMYK) (GWG 2015)". In the Production Automation Script drop down list choose "Magazine Ads (CMYK) (GWG 2015)". The product "Convert to Magazine Ads (CMYK) (GWG 2015)" is added in the Products list. In the Order field enter "Magazines". Enable the checkbox "Split multipage files into separate Jobs". In the Products drop down list choose "Convert to Magazine Ads (CMYK) (GWG 2015)". Enable the order checkbox "Magazines". Drag and drop the PDF file "Mercedes Ad.pdf". The PDF file is converted to a job. The job is processing automatic based on the created product. The Proof and Production Automation scripts are applied. The PDF file is succesful converted to the magazine standard of GWG 2015. The job is waiting for approval. Double click on the job "Magazines-1". A proof preview is created. In the approval panel you have tools to analyze the proof. Collaboration tools such as comments are included. Clicking on "Download" opens a drop down list to save the Production and Proof PDF file. In the previous tutorial "Preflight a magazine advertisement" I created a magazine workflow. One job is waiting for customer approval. The customer is able to upload new jobs that automatic preflight the PDFs for magazine printing according to the GWG 2015 specifications. In tFLOW the customer is also able to collaborate job info with the prepress department. Double click on order "Magazines". Click on the admin avatar. Enter the customer e-mail address. Now you are sign in as a user with customer permissions. No access to the Settings panel and other admin functionality. These settings can be modified by the admin user. On the Dashboard panel one job is waiting for customer approval. Click on the order "Magazines". The PDF file is succesful converted to the magazine standard of GWG 2015. The job is waiting for approval. Click "Zoom In" to check the details of the proof. Three warnings are provided. Each warning has an explanation. Click on the "Fixed" tab. In the PDF file six corrections have been executed. Each fix has an explanation. The PDF report has annotations that shows and explains the warnings. As a customer you are able to share proof comments with the prepress department. Click on the "Information" tab to add a general comment. Enter the comment "The colors are fine. Thanks!". In the drop down list choose the prepress operator. The comment is added in the "Comments" box. Enter a description for the colleague. Enter the colleague his email adress. The colleague receives a notification email with the description and the proof in the attachment. If he has a tFLOW account, he can sign in and view online. NOTE: Notification emails has to be enabled by the administrator in the Settings panel. tFLOW is creating a PDF file for production. The job is ready to send to production by the prepress department. The customer gave permission. Drag and drop the PDF file "Mercedes Add_A-Class.pdf". The PDF file is converted to one job. tFLOW is preflighting the PDF file to the magazine standard of GWG 2015. Double click on the job "Magazines-2". The job is on hold because of one error. The resolution of the color image larger than 16x16 pixel is less than 150 ppi inside the BleedBox. This will result in a bad print, an updated version of the PDF is needed. Drag and drop the PDF file "Mercedes Add_A-Class_vs2.pdf". tFLOW is preflighting the revision PDF file to the magazine standard of GWG 2015. Two warnings are provided. Each warning has an explanation. Move the annotation next to the image. Enter the comment "This is the best quality image we have.". In the order "Magazines" you have an overview of the two approved jobs. Click on the customer avatar. The job is approved by the customer. The prepress operator see the added comment and can response if required. Clicking on "Download" opens a drop down list to save the Production and Proof PDF file.